Mumbai’s torrential downpour in July left the city waterlogged and its residents grappling with a now seemingly annual weather disaster. 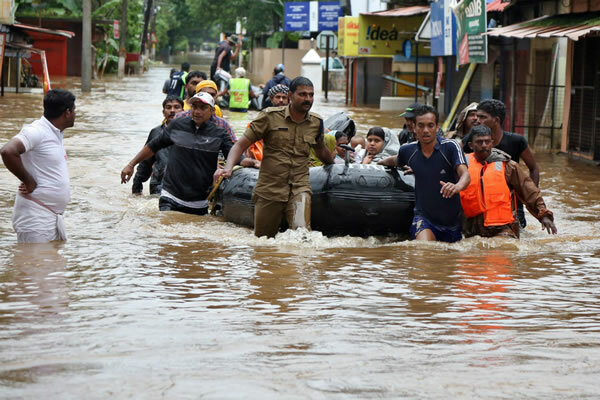 The city reportedly received 65% of its share of the 2018 monsoon rains within a mere 3 days. However, its civic authorities may have to grapple with even heavier rainfall in the near future, with their challenge exacerbated by Mumbai’s unregulated urbanization, influx of migrants and encroachment of its natural drainage systems. On the other end of the spectrum, the prolonged droughts in the Vidharba region (Maharashtra) and Tamil Nadu – that have taken the earnings and lives of several farmers – could turn even more severe. This is because India seems to have been well and truly gripped by extreme weather events, the driver behind which is fairly straightforward – the accelerating impacts of human-induced changes to global climatic cycles. Decades of irresponsible exploitation of fossil fuels has released billions of tons of CO2 and other greenhouse gases into the atmosphere, which seems to have finally pushed the delicate balance of planetary climate cycles over the edge. Unfortunately for India, it happens to be the country most vulnerable to this disruption. To understand how this threat has materialized, one needs to begin by understanding the interaction between global sea surface temperatures (SST) and rainfall cycles. Since warmer air has more capacity to hold moisture, it can lead to more moisture-laden winds making landfall and therefore, heavier rainfall. A 2017 study by the Indian Institute of Tropical Meteorology (IITM), Pune confirms the theory. In fact the study also found that the frequency of extreme weather events in India has tripled over 1950-2015, with heavily moisture-laden winds from an increasingly warmer northern Arabian Sea driving a surge in precipitation over central and eastern India. Unsurprisingly the warming was found to be linked to rising carbon emissions. The other factors attributed to driving heavier precipitation are ever-increasing urbanization and air pollution. The former tends to create ‘heat-islands’ – due to our near-complete reliance on metal and concrete for construction – which can lead to more intense convergence of moisture, and therefore heavier rainfall over a smaller geographic spread. The latter on the other hand affects rainfall through the emission of particulate matter (PM)/aerosols, since they have been found to delay light rainfall. This allows for the formation of bigger storms and the possibility of extreme levels of rainfall. Paradoxically though, this effect seems to hold true only over shorter time scales. Over several decades, PM and aerosol emissions have in fact been shown to decrease the overall volume of rainfall – since the cooling induced at surface (by scattering sunlight) is thought to interfere with conditions required for the buildup of rain-bearing clouds. One clear manifestation of the above factors are the heavy rainfalls and floods in Gujarat and Tamil Nadu (2015), Assam (2016), Gujarat and Tamil Nadu (2017), in Mumbai and Assam this year and most recently in Kerala. This increase in average oceanic surface temperatures also seems to have affected other regions – such as the US, which is facing more intense and more frequent rainfall (driven by stronger hurricanes). Meanwhile Japan, Taiwan and China were soaked with record rainfall by Typhoon Maria – the likelihood and severity of which is thought to have been amplified by climate change. Unfortunately, extreme downpours also lead to most of the precipitation running off to rivers or the oceans, which severely hampers the replenishment of ground water tables through natural rainwater seepage. Climate change is also very likely behind arid and semi-arid regions receiving less rainfall with each passing year. The correlation is yet to be proven through exact climatic models since the system is governed by several intricately linked factors that aren’t yet fully understood. However, it is not foolish to reason that the very same climate change that is driving excessive rainfall in wet regions could also be driving ‘desertification’ in traditionally rain-deficient geographies. In fact the persistent drought in South Africa – which recently led to an unprecedented water crisis in Cape Town – is claimed to have been made three times more likely due to climate change. The same is very likely behind the shrinking Himalayan glaciers – India’s largest source of freshwater. Unfortunately the world’s continued dependence on fossil fuels means that planet is growing warmer. 2015, 2016 and 2017 were the warmest three years ever recorded, and the distinction may be broken in the years to come. This implies that apart from growing freshwater shortage, extreme weather events are likely to become even more frequent. Predictably, the socio-economic cost of such weather will be immense. IITM’s 2017 study estimates that the world suffered losses worth over $30bn in the last decade due to floods alone, with India shouldering 10% of the damages. 69,000 people have also been killed and 17 million people have been displaced or left homeless in India over 1950-2015. This number may very well escalate due to India’s dependence on favourable monsoon rains for agricultural output and livelihoods. Too much rain will be just as calamitous as too little of it. The losses caused by floods on the other hand also extend to damage to movable and immovable assets, as well as a blow to the country’s economic output through disruption to man-days. The exact cost of the latter is extremely difficult to estimate, but possibly runs into several billion dollars each year. The situation is therefore of grave concern. Despite India’s impressive progress on installing renewable sources of electricity, it still derives over 70% of its energy from carbon heavy, coal-fired power. And even if the country transitions to renewables dominating its energy mix within the next decade, the greenhouse gases that India – and the rest of the world – has already released will continue to drive climate change for several decades to come. Also since the gravity of the Paris Agreement seems to have failed to sink in with certain nations, we must now step up as the global climate action leader. The challenge is quite steep indeed, since every country will want to sustain its economic growth while at the same time attempting to do its part in limiting global warming to 1.5-2C. Unfortunately with the world already having warmed by over 1C, we have very little time left. Therefore regardless of decisions taken by other countries, India needs to accelerate its own climate action and set an example to the global community on how best to fend off the humanitarian crisis that lies ahead. Dr. V. Vinoj is an Assistant Professor at the School of Earth, Ocean, and Climate Sciences, IIT Bhubaneswar, India. He received his Ph.D. in 2009 in atmospheric sciences from the Indian Institute of Science, Bangalore. He is an atmospheric/climate scientist by training. His expertise lies in the integration of both observations and modeling to understand various aspects related to aerosol effects including radiative forcing, monsoon rainfall and long range transport of aerosols/pollutants.